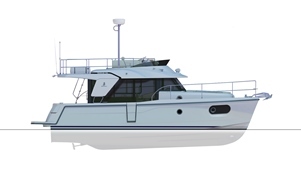 Cut out for the high seas, the Swift Trawler 30 provides a comfortable living space. 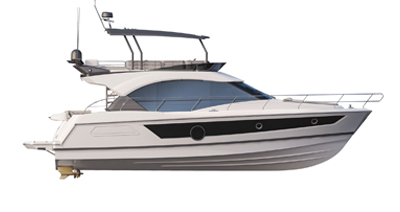 Her autonomy and numerous fittings simplify life onboard. Optimum safety is accomplished onboard with hand rails everywhere, high pulpits and a large well-protected starboard walkway. The panoramic view from the helm is unique on this type of boat and gives you as much confidence underway as it does pleasure. Highly innovative, the transom lowers to increase the size of the cockpit, turning it into a terrace over the sea, while the fold-away fly ladder clears an even greater amount of space. The removable rotating flybridge table allows customizable organization of the upper deck. High performance and economical, with autonomy of around 160 miles at cruising speed and large capacity water tanks, the Swift Trawler 30 will take you places where no other craft of similar size would dare venture. Workshop version including Hanging locker, Storage and 2 Opening portholes.